Good Afternoon Besties! 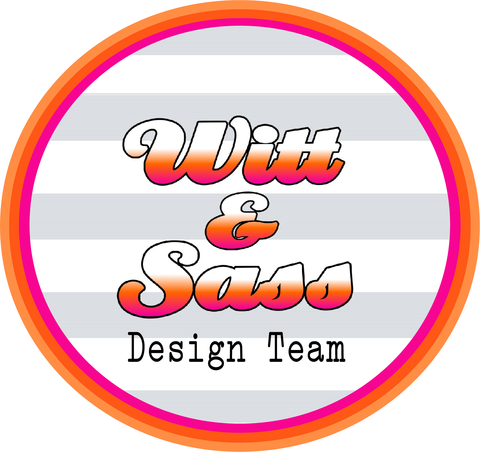 Today starts our first challenge over at My Besties Colour It Create It Show It Off Challenge Blog. 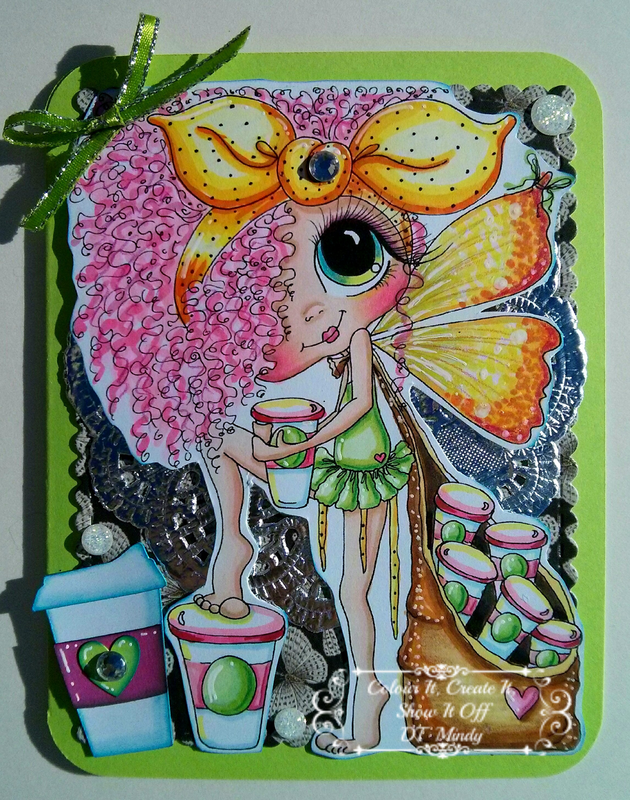 For my Design Team Project I created this Adorable My Besties Coffee Fairy Card. For my card I used one of Sherri Baldy's Gorgeous My Bestie Digital Stamps called Image 947 that you can find here: http://www.mybestiesshop.com/store/p3026/INSTANT_DOWNLOAD_Digital_Digi_Stamps_Big_Eye_Big_Head_Dolls_Digi_My_Besties%22_Img947_Coffee_Fairy_By_Sherri_Baldy.html. To create my card first I made the card base out of basic shapes in Design Space. I then used the Fancy Frames Dies from CDD to cut my mats from patterned butterfly card stock. Next I sized the My Bestie Digi Stamp to fit my card perfectly and printed her out onto 110 lb. plain white card stock. I then colored her with Copics, and then added my highlights with Prismacolor Premier Pencils. To finish I attached all of the elements to my card base and added rhinestones and sequins for some extra embellishment. Hello Besties! Tonight I want to share with you some super exciting news. 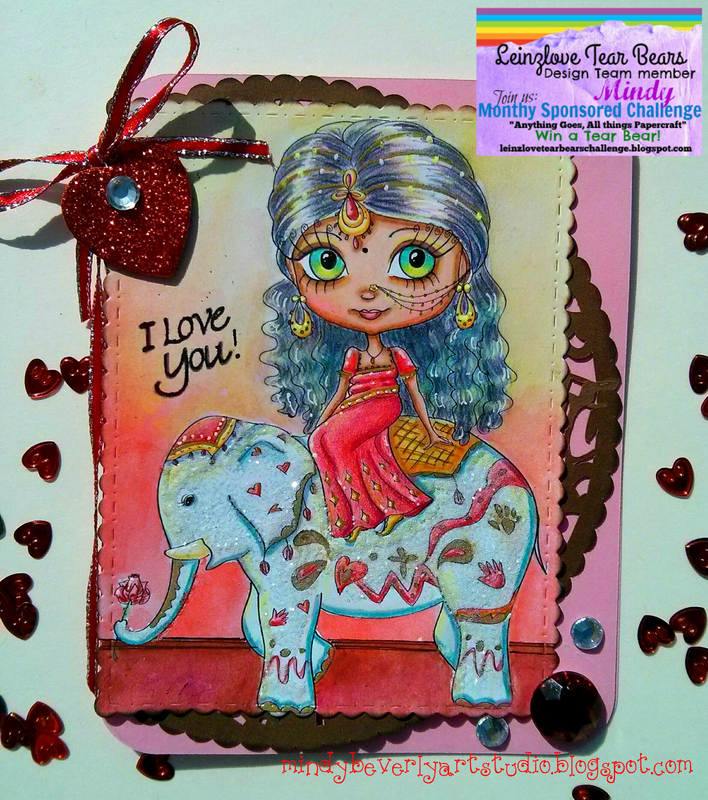 The My Besties Meet at the Scrappers Corner Challenge Blog has now changed over to My Besties Color it Create it Show it off. Happy Sunday Besties! Today I want to share with you a My Bestie Bubble Bath Card that I made. To create my card I used one of Sherri Baldy's new My Bestie "fluffy" Digital Stamps called Image 055 that you can find here: http://www.mybestiesshop.com/store/p3306/NEW_%22Fluffy_Besties_TM%22INSTANT_DOWMLOAD_Digital_Digi_Stamps_Big_Eye_Big_Head_Dolls_Digi_Img055_New_Fluffy_Besties_TM_By_Sherri_Baldy.html. To make my card first I printed out the My Bestie image onto plain white 110 lb. card stock. I then colored her with Copics and then used Prismacolor Premier Pencils for the highlights. Once I was finished coloring this Sweet Bestie, I then fussy cut her out and attached her to my card base with foam tape for some added dimension. The card base I made out of basic shapes in Cricut Design Space, and the mats were cut with the Fancy Frames Dies from Craftin Desert Divas. To finish my card I attached all of the layers to my card base, and then added flowers and rhinestones for some extra sparkle and embellishment. Good Afternoon Besties! Today I want to share with you a My Besties Fluffy Tea Time card that I made. First I sized the Bestie Digital Stamp to fit my card base perfectly. I then printed her out onto 110 lb. white card stock. Next I colored this sweet image in with the following Copics: Skin: E000, E00, E21, and E11. Hair: E47, E37, E35, and Y00. 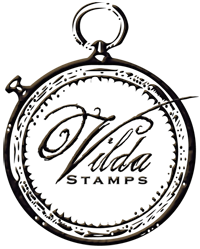 Clothes: RV04, RV02, RV10, BV04, BV02, and BV00. Good Afternoon Besties! In honor of Valentines Day tomorrow, I wanted to share with you a Bestie Box of Chocolates Valentine Card that I made. To create my card first I made the card base out of basic shapes in Design Space. I then sized and printed out the sweet fluffy Bestie digital stamp. Next I colored her with Copics and Prismacolor Premier Pencils. Once I was done coloring her, I then fussy cut her out and set her aside. Next I cut the mat behind the Bestie out of patterned card stock with the Fancy Frames Dies from CDD and my Big Shot. After that I went back into Design Space and uploaded the pattern of the candy box from LSHD and sized it to fit my card. Once I was happy with my design, I then cut out all of the pattern pieces with my Explore in plain and glitter card stock. After that I inked and chalked all of the paper edges to add dimension and shape. I then assembled everything and attached all the layers to my card base. To finish I added pearls, ribbon, and rhinestones. Thank you so much for stopping by and I wish you all a very Happy Valentines Day! Good Afternoon Besties! Today I want to share with you a My Besties Fluffy Beach Girl Card that I made! To create my card first I made the card base in Design Space out of basic shapes. I then cut the frames with Fancy Frames Dies and Landscape dies from Craftin Desert Divas. Next I printed the My Bestie Digi Stamp onto plain white 140 lb. card stock. I then colored the image with my Copics and Prismacolor Premier Pencils. Once I was finished coloring this cutie, I then fussy cut her out, and attached all of the layers to the card base. Hello Besties! 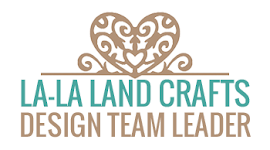 Today I want to share with you my most recent My Bestie Facebook New Release Design Team Project! 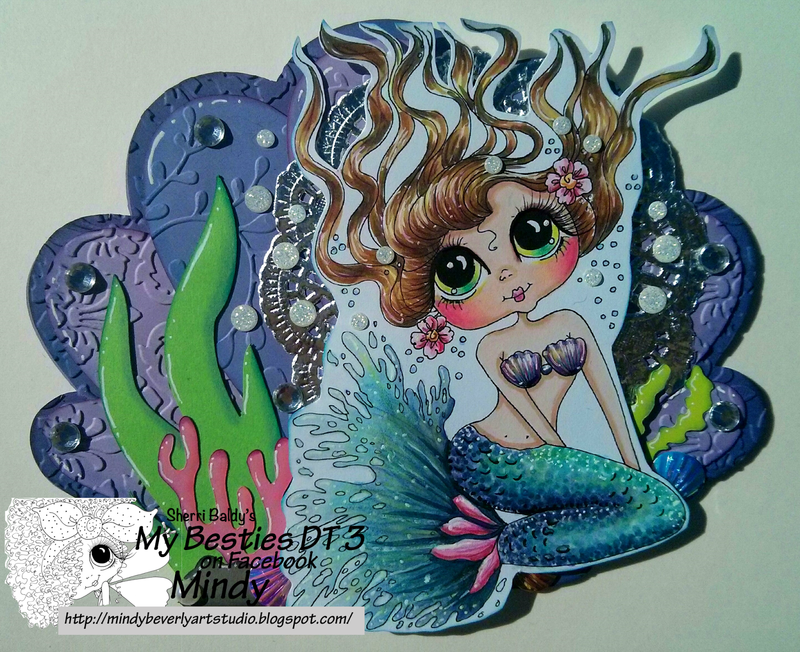 I created this Beautiful Bestie Mermaid Shaped Card. To create my card first I printed out the My Bestie Digi onto plain 110 lb. white card stock. I then colored this sweet mermaid with Copics and Prismacolor Premier Pencils. Once I was done coloring her, I then fussy cut her out and inked the edges of the cut out. For the card base I used an svg from Svg Cutting files called Clam Shell Shaped Card. I sized the card to fit my Bestie perfectly and then cut out the pattern pieces with my Explore. Next I inked and chalked all of the paper edges to add dimension and shape. I then took the shell pieces and embossed them with an Anna Griffith embossing folder in my Big Shot to add some extra interest and texture. After that I assembled everything and attached it to my card base. To finish I added glitter enamel dots, rhinestones, and shell sequins for some extra glitter and embellishment! I hope that you enjoy my project, and I wish you all a Beautiful Day! Happy Saturday! Today I want to share with you my Hop Project for the Little Scraps of Heaven Designs Facebook Hop going on now. For my project I created this super fun Beary Sweet Box Card. The box card base I created myself from basic shapes in Cricut Design Space. 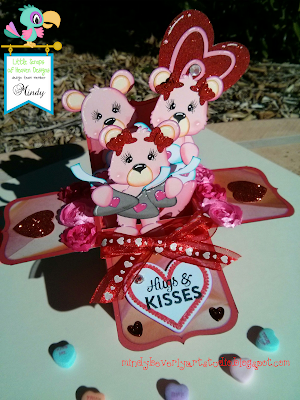 I then uploaded the Beary Sweet Pattern and sized the little bear images to fit my box card perfectly. Once I was happy with my design, I then cut out all of the paper pieces with my Explore. Next I inked and chalked all of the paper edges to add dimension and shape. After that I assembled all of the pattern pieces and then attached the bears to my box card. 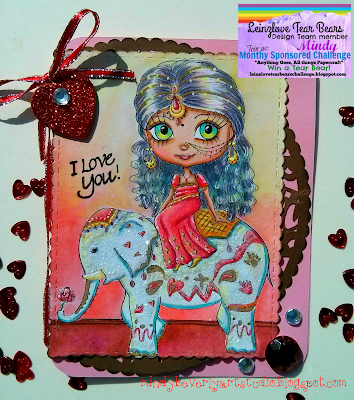 I then stamped my sentiment and cut out around the heart with my Big Shot and a Recollections Stamp/Die set. Next I added Ribbon and fabric flowers to the top of my box card. To finish I added sequins and rhinestones for some extra embellishment. The second project I created for the Hop is a Box of Chocolate Mouse Shaped Card. To make my card first I uploaded the Mouse pattern into Design Space. I then layered the image and regrouped it back together. Next I duplicated the image and selected weld to create my shadow layer. After that I made another duplicate copy of my welded image and then mirrored it. I then layered both of the welded images together just slightly overlapping where I wanted my card to fold. Next I welded both the shadow layers together and then attached a score line. Once I was happy with my shaped card, I then cut out all of the pattern pieces with my Explore in plain and glitter card stock. Next I inked and chalked all of the paper edges to add dimension. After that I assembled all of the pattern pieces and attached them to my card base. To finish I added sequins and rhinestones. Thank you so very much for stopping by and have a fantastic day! Good Afternoon CDD Fans! 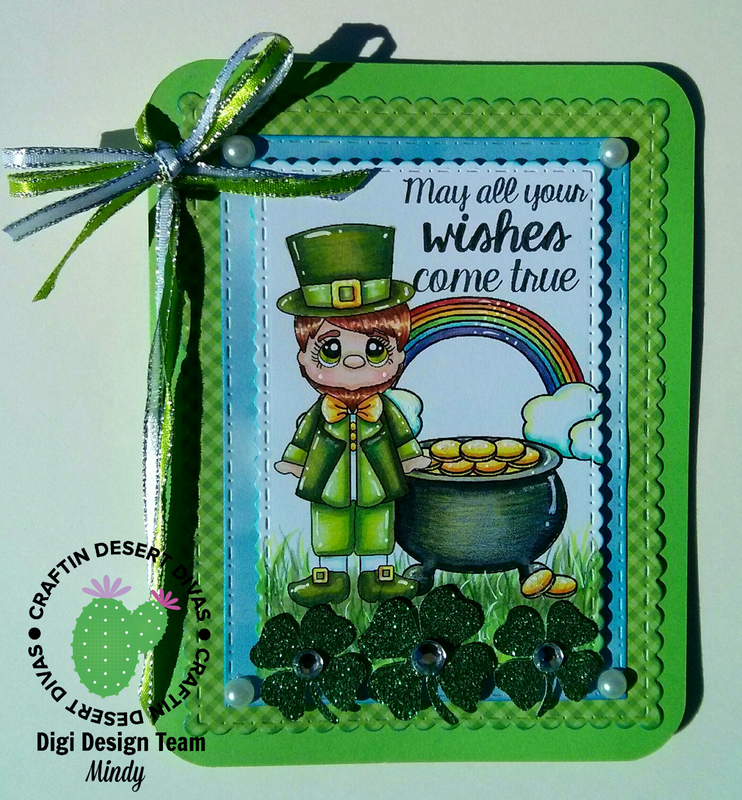 Today I want to share with you a Lucky Leprechaun Card that I made! To create my card first I layered the png versions of the digital stamps to create my scene. I then sized the image and printed it out onto plain white 110 lb card stock. Next I colored my scene with Copics and Prismacolor Premier Pencils. Once I was finished coloring the image, I then used the smallest scalloped rectangle from the Fancy Frames Dies to cut out the part of the scene that I wanted. Next I cut out the remaining mats and frames with the Dies in plain card stock and patterned Doodlebug Paper. Good Afternoon Everyone! 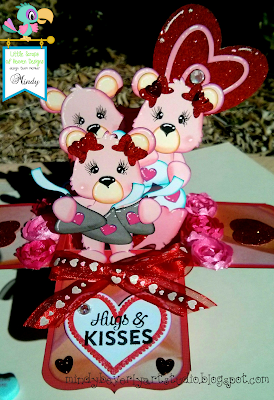 Today I want to share with you my Design Team project for the Leinzlove Tear Bears Challenge Blog. To create my card first I sized and printed out the digital stamp. I then colored the image using Copics, Prismacolor Premier Pencils, and Lukas Watercolors. Once I finished I cut out around my image with the Fancy Frames Dies from Craftin Desert Diva's. Next I created the card base from basic shapes in Cricut Design Space. I then selected the paisley mat from the Cricut image library, and sized it to fit my card perfectly. Once I was happy with my design, I then cut out the card base and mat from plain card stock with my Explore. Hello Besties! 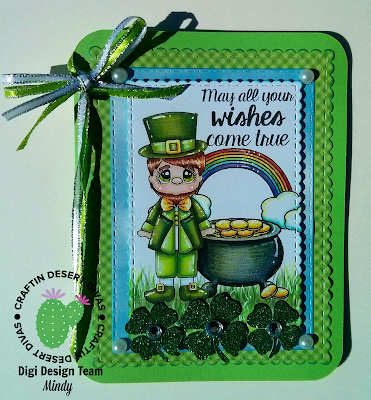 Today I want to share with you one of my Design Team Projects for our February Anything Goes Challenge #21 over at My Besties Meet at the Scrappers Corner Challenge Blog. To make my card first I created my card base, mats, and frames from basic shapes in Design Space. I then uploaded the digi stamp and dream catcher and sized the images to fit my card perfectly. 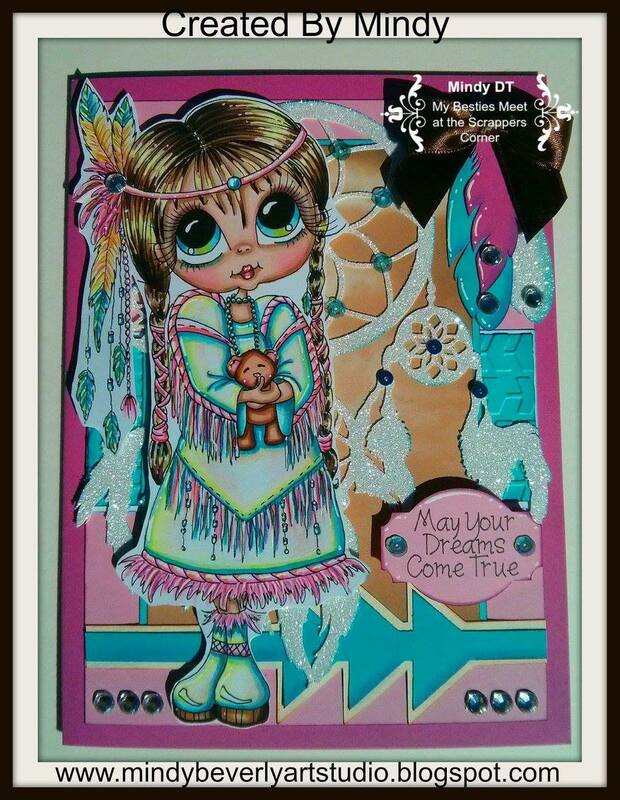 Next I added the arrow border and feathers from the Cricut Library, and sized them to fit my card as well. After I was happy with my design, I then cut out all of the images and paper pieces with my Explore.